And time marches on. This cool photo, taken from the heart of Oslo back in the 1880s (when it was still Christiania), looks from Stortinget (the Parliament buildings) down Karl Johns gate toward Det Kongelige slot (the Royal Palance). The tram line no longer runs down this main thoroughfare. This was taken long before the existence of Deli de Luca. In the summertime, the trees lining Karl Johan are so tall and full, they would obstruct this particular view of the palace. Construction on the castle began in the 1290s. Built to guard Oslo's harbor and town from attack, the fortress has successfully survived several sieges, first by Swedish forces, but also by Charles XII in 1716. It was, however, surrendered to the Nazis without a fight in 1940, after the Norwegian government had been evacuated from the capital. "After the war, eight Norwegian traitors who had been tried for war crimes and sentenced to death were also executed at the fortress." In the early 17th century, the fortress was modernized and remodeled to appear more like a renaissance castle. Today, several museum exhibits are worth touring within its ancient walls, and Jonathan and I have witnessed more than one bridal party preparing to hold a ceremony on the grounds. The Gamle Rådhus acted as Christiania's city hall between 1641 and 1733, then housed the Supreme Court. Today it operates as a restaurant , and the interior has been entirely redone. Left: Gamlebyen Church today from the stone building side. Right: A view of Christiania in the 1800s. You can see the white tower of Gamlebyen Church. Sitting on the original site of Abbey Church, which was built in the late 1200s and destroyed during a Swedish attack in 1536, Gamlebyen Church belongs to Oslo University Hospital. The building you see today was finished in 1796, and is flanked by a "stone building" completed in 1737. But both have had to be rebuilt multiple times in the last 200+ years. 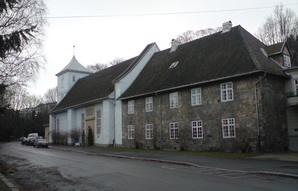 It is one of the oldest operational churches in Oslo. 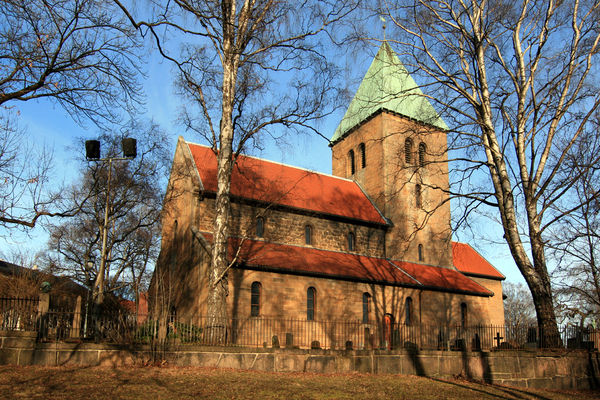 The oldest building in Oslo, this church is a Norwegian Cultural Heritage Site. It is located atop a hill in the burough of St. Hanshaugen, built above an old silver mine. The oldest part of the church grounds dates back to the 1100s.